The top secret labs at Facebook are in overtime right now: another experimental FB feature has been spotted in the wild. Soon we might be commenting on comments. Hospitals are increasingly milling their patients’ confidential medical records to target their promotional mailings for services, reported Phil Galewitz of USA Today. It’s not illegal, but the practice doesn’t sit well with consumer advocacy groups who point out that many health care providers are choosing to ping patients with better insurance coverage. That creates a sort of indirect discrimination, as hospitals make it harder for consumers with less insurance to learn about services they may very well need. To target the ads, hospitals determine the likelihood that patients would need certain services based on age, income and insurance status. Hospitals have said they target patients with private insurance because the companies tend to pay higher rates than government-backed plans like Medicare and Medicaid. The mailings also advertise a variety of tests, such as screenings for cancers and cholesterol, which are generally more expensive. To make matters worse, employers are also reducing health insurance benefits in the workplace. As we recently reported, one in five Americans are experiencing difficulty paying off their medical debt, while 25 percent have considered filing for bankruptcy because of rising medical bills. Though targeted mailings might place others without insurance at a disadvantage, hospital officials insist they target patients who pay more to make enough profit to serve everyone. Well this is mildly terrifying: according to a new Pew study, the Facebook privacy mode a lot of us rely on for photos and status updates is, on average, anything but private. Time to reconsider your settings, everyone. Facebook users can reach an average of more than 150,000 Facebook users through their Facebook friends; the median user can reach about 31,000 others. At two degrees of separation (friends-of-friends), Facebook users in our sample can on average reach 156,569 other Facebook users. However, the relatively small number of users with very large friends lists, who also tended to have lists that are less interconnected, overstates the reach of the typical Facebook user. In our sample, the maximum reach was 7,821,772 other Facebook users. The median user (the middle user from our sample) can reach 31,170 people through their friends-of-friends. When you think friend of a friend, the IRL analogue comes to mind. Your buddy’s buddy. That guy you met at a bar who seems okay. Your girlfriend’s pals from college. They must be okay people, right? They’re so narrowly removed from you, why not share all your photos with them? Peanut butter and jelly, unicorns and glitter, Beats Electronics and Monster. One of these things just doesn’t belong, one of these things is not like the others. After a five-year collaboration, the two companies have terminated their relationship but do hope to remain friends. Monster takes credit for the design and production “They wanted to do speakers and I said, ‘The new speaker is the headphone,’ ” says Lee. Beats, on the other hand believes its celebrity connections helped market the devices as high-quality status symbols. “Now a big part of what you’re paying for is the brand and fashion,” Ben Arnold, director of industry analysis for NPD, told Businessweek. In a single minute there are over 695,000 status updates on Facebook. 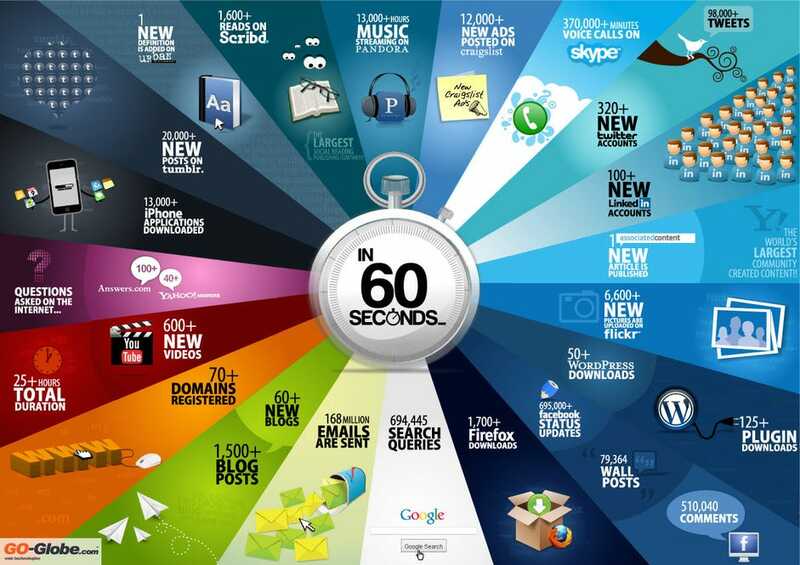 That’s just one example of the mind boggling scale of online activity. 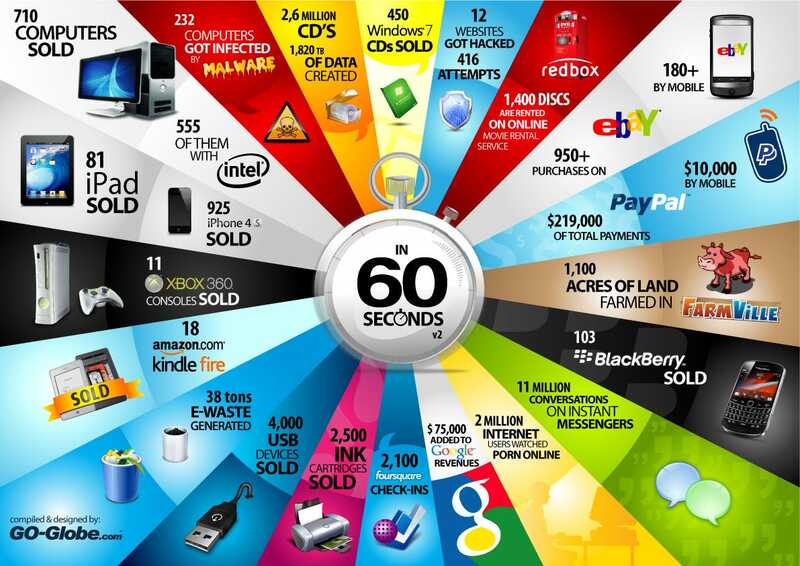 The following infographics show a bunch of other incredible things that happen in 60 seconds (via Barry Ritholtz). The death of Osama bin Laden. 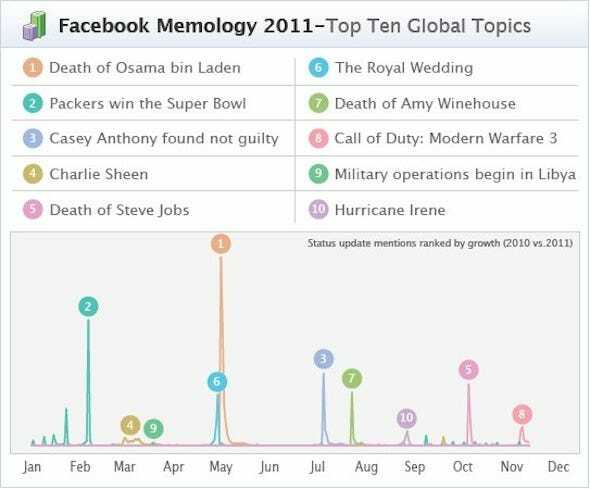 10 percent of all status updates (in English) mentioned Osama bin Laden in the days following his death, according to a Facebook blog outlining the top ten global trends in 2011. Coming in second was Green Bay Packers beating the Pittsburgh Steelers in the Super Bowl. Charlie Sheen was winning in March, if you recall. Each month engagement centered around the hottest current events. For instance, conversations about the Royal Wedding were really popular during April. Mentions of the marriage shot up 600-fold, according to the Facebook post. The blog post also looked at the memes that emerged this year. In it, you’ll see planking — you know, where people lie down in an unusual place. It hit a spike after Max Key, the son of New Zealand Prime Minister John Key uploaded a photo to Facebook, then celebrities gave the meme a second wind, but then it just sort of disappeared. If you don’t know what “lms” is or “tbh” — then you’re clearly not spending enough time on Facebook. This quote comes from Tim Harford, who argues that success is really just a product of failure. He believes we have to try, fail, and quickly correct our mistakes in order to properly succeed. Because failure is just an inevitability, no matter who you are, the key is to get better at recovering from it rather than trying to avoid it altogether. Harford suggests that there are a few key things we need to pay attention to when dealing with failure. First is avoiding the denial that we’re wrong. He says, “It seems to be the hardest thing in the world to admit we’ve made a mistake and try to put it right. It requires you to challenge a status quo of your own making.” Sometimes we’ll go so far as to chase our losses just to avoid failure, as if accepting the failed situation will make all our effort worthless. In the end, we can’t predict what’s going to work. We can only experiment with trial and error. Failure is an important part of this process, and accepting it makes us capable of actually finding success in the long run. For more information, check out the full article on The 99 Percent. For another take on the same idea, check out this article in the New York Times. 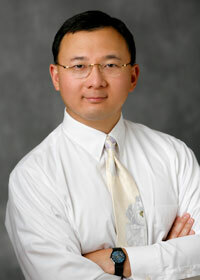 You can follow Adam Dachis, the author of this post, on Twitter, Google+, and Facebook. Twitter’s the best way to contact him, too. As more and more users adopt tools to de-clutter web pages and remove all distractions (such as ads) the effectiveness of display ads will continue to decline, despite innovations and advancements in targeting technologies. The Safari 5 feature that’s caught the web’s attention is the Reader button, which strips down articles and blog posts into an ad-free, highly readable format. Two add-ons for Firefox and Chrome do a good job of recreating that convenience. If you missed our round-up of what’s new in Safari 5, the short explanation of Reader is that, while many bookmarklets have come along to offer a simplified, less-cluttered reading experience, Safari is the first major browser to go ahead and offer that kind of feature by default, as an address bar button. If you’re a fan of bookmarklets, and your bookmarks aren’t too cluttered to lose them in, we recommend the tools from arc90’s Readability, the Instapaper Text bookmarklet, and the Readable app for highly customized formatting. Baris Derin rolled the Readability bookmarklet into a full-fledged add-on for Firefox, but also added in a pretty neat auto-scrolling feature for the true lean-back-and-read experience. Readability tends to keep more of the text and formatting in and around the page, but strips out all the marketing and navigation material. It places an “R” button in the lower-right status area of Firefox, which isn’t the most convenient spot for our use, but some may prefer having it hidden away until needed. 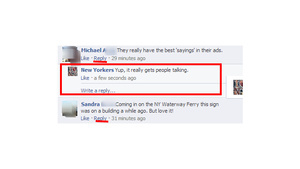 Notice the transparent icons, too, that provide printing, email, and refresh functions for live-updating posts. Mhd Hejazi’s iReader is directly inspired by Safari’s Reader function, offering the same kind of pop-out white box that darkens the rest of the page, a button right in the address bar, and very, very minimal decoration—as you can see, it pared down our Top 10 feature quite a bit. There are also keyboard shortcuts for Windows and Mac to activate iReader, and options to change the background opacity, font and formatting, and add a “Send with Gmail” link to your articles. Neat stuff. Both add-ons are free downloads. Know of another reading/simplifying extension that gets the job done? Tell us about it in the comments. Thanks to emmikkelsen for the inspiration!